The Leopard tortoise is the fifth largest land tortoise in the world. There are two commonly recognised subspecies, Geochelone pardalis pardalis and Geochelone pardalis babcocki. 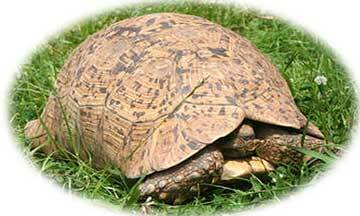 The Leopard Tortoise is a very large, delicate, non-hibernating species, that requires a large heated area throughout the winter and poor summer months, which is very costly and difficult to achieve for most. This is a tortoise for the serious keeper where ongoing expense is no object.